I want to alert all Georgia parents of infants who may own a Simplicity bassinet. Do not use it any more. 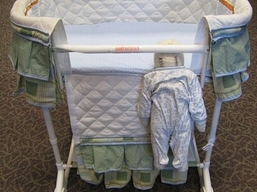 These bassinets have been recalled because they may lead to strangulation death of the infant. It has come to light, however, that the distributor of these deadly bassinets, SFCA, Inc., ignored the recall and did not notify bassinet owners of the danger. The Illinois Attorney General has filed suit against SFCA, Inc. for ignoring the recall and subjecting more families to a needless risk of death by using these bassinets. The Consumer Products Safety Commission (CPSC) is considering changing its rules covering crib defects. Congratulations to Attorney General Madigan for showing the courage to go after these manufacturers for putting our children at risk. I would like to see the Georgia Attorney General, Hon. Therbert Baker, do the same thing and file suit against SFCA, Inc. Until then, check the manufacturer of any bassinet you may have in your house and if it is manufactured by SFCA, Inc., do not continue to use it and return it to SFCA, Inc. Also, you might want to alert the CPSC. Keep your babies safe!